Town hall with the Nueva Fuerabamba community. Photo by Peru's Ministers Council. Following a blockade that lasted for over two months, Peru’s national highway CU-135, known as Corredor Minero del Sur, was reopened this weekend and trucks carrying copper concentrate from Las Bambas mine started running through it again. 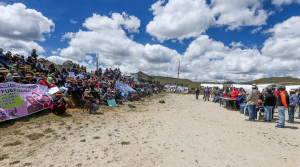 A 12-kilometre section of the runway in the southern Cusco department had been blocked for 68 days by protesters from the Nueva Fuerabamba community, whose farmland is cut by the road. The blockaders said that the government illegally turned CU-135 into a national highway to be able to ink a deal with Minera Las Bambas, a joint venture between MMG, a wholly-owned subsidiary of China’s Guoxin International Investment, and CITIC Metal Co. Ltd. But last week, the community met with government officials and company representatives and signed an accord where Nueva Fuerabamba agreed to remove the barricade and the miner agreed to employ workers from the community and honour unfulfilled promises. Panoramic view of the town hall with the Nueva Fuerabamba community. Photo by Peru's Ministers Council. Following this initial deal, on Friday the community hosted a 7-hour long town hall with Peru’s Minister of Development and Social Inclusion, Paola Bustamante; the Vice-Minister of Territorial Governance, Raúl Molina; Congressman Richard Arce and MMG Las Bambas General Manager, Edgardo Orderique. During this audience, the parties involved in the negotiations agreed upon the importance of allowing the free flow of traffic on the Corredor Minero del Sur. “The State is present here and we are working towards rebuilding trust. We’ll continue the dialogue and we are committed to not doing anything by force. Company trucks can circulate starting tomorrow,” Bustamante said during the encounter. 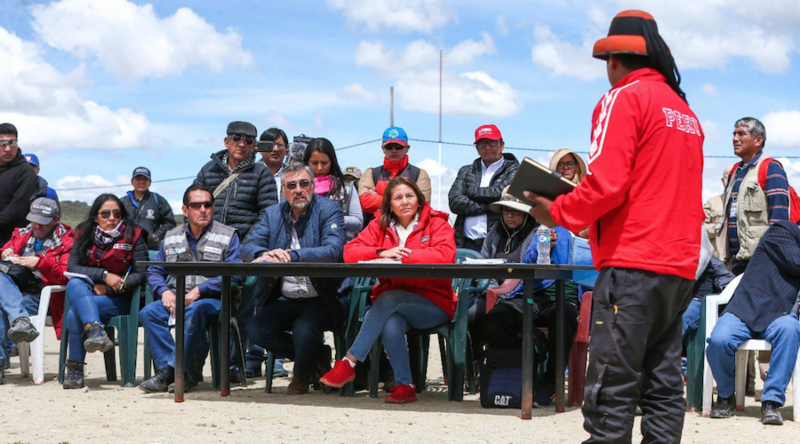 Given the presence of national authorities on their land, leaders of the Nueva Fuerabamba community took the opportunity to ask for their legal advisors, Frank y Jorge Chávez Sotelo, to be released from prison. The lawyers were jailed 10 days ago after a prosecutor accused them of manipulating Fuerabamba villagers into blocking the road. However, the minister of development said that under Peruvian law the separation of powers must be respected. “The lawyers’ release does not depend on the executive power. The judicial branch is autonomous,” Bustamante said. The Nueva Fuerabamba blockade kept 8,000 workers off the mining complex and, according to MMG, almost triggered a total stoppage of activities. Las Bambas has an annual nameplate throughput capacity of 51.1 million tonnes and in 2017 produced 450,000 tonnes of copper concentrate.